In Australia an average of eight people take their own lives every day; that’s one every three hours. Over the years countless organisations have been created to bring this too often overlooked issue into the light, but despite all the campaigns around suicide prevention staged in the past 20 years rates are continuing to rise. September 10 is World Suicide Prevention Day #WSPD2018, and this year’s theme is ‘Working Together to Prevent Suicide’. In order to remind us of just how many Aussie families are touched by suicide each year we thought we’d compile a few startling facts that highlight the sheer scale of the issue. According to the Australian Bureau of Statistics (ABS) in 2015 our suicide rate hit a 13-year high, when 3,027 Australians took their own lives. In 2016 there was a small reduction in this number, however there were still 2,886 people who died by suicide. These high numbers can be largely attributed to a rise in the suicide rate among middle-aged and young women. Consistently over the past 10 years, the number of suicide deaths was approximately 3 times higher in males than females. According to Mindframe, 75% of people who died by suicide in 2016 were male. While we’ve recently seen an increase in the suicide rate among women, males remain 300% more likely to take their own lives than females. 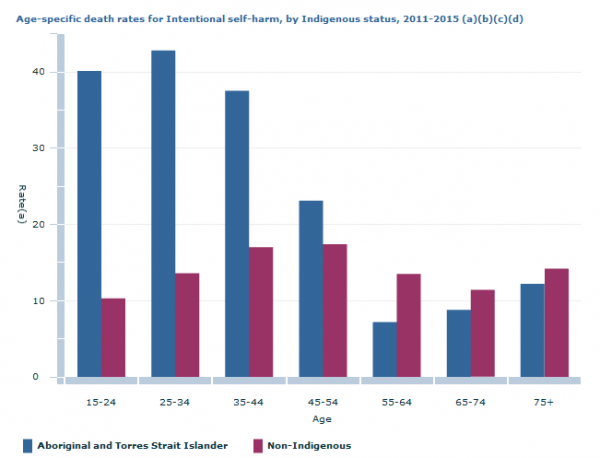 For those of Aboriginal and Torres Strait Islander descent in NSW, QLD, SA, WA and NT there were 162 deaths due to suicide (119 male, 43 female), which was the fifth most common cause of death. While suicide is a big problem across our entire society, for Australia’s Aboriginal peoples, it’s at epidemic proportions. As the esteemed suicide prevention researcher Gerry Georgatos recently wrote in The Guardian Australia the figures below may not even represent the full extent of the issue. 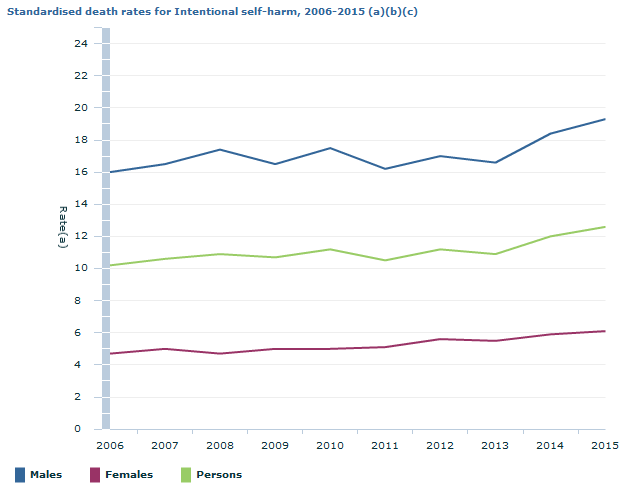 Despite the fact that men are three times more likely to take their own lives than women, females account for more than 60% of hospitalisations from self-harm. And this is a phenomenon that is far from being exclusive to Australia. 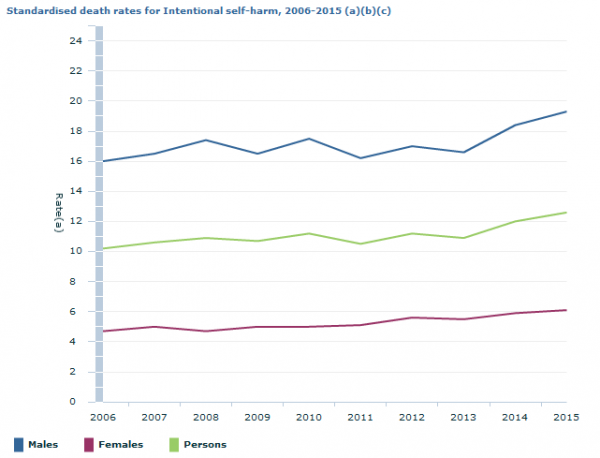 According to UK based Psychology professor Daniel Freeman this discrepancy is largely due to the different means that the two genders use when attempting suicide. In 2016, suicide accounted for over one-third of deaths (35%) among people 15-24 years of age, and over a quarter of deaths (28%) among those 25-34 years of age. According to the ABS, for those people 35-44 years of age, 16% of deaths were due to intentional self-harm. The proportion of deaths due to suicide decreases in older age groups, as the likelihood of dying from natural causes of death increases. 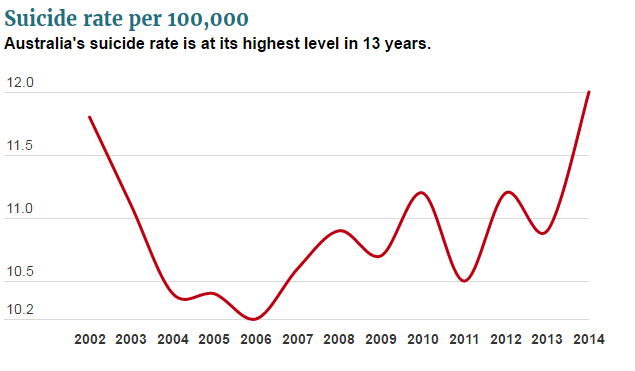 The biggest reduction in number was in Queensland, which has contributed to the overall decrease in the number/rate of Australian suicides in 2016. 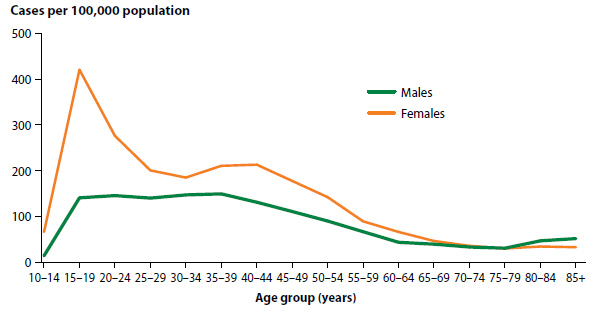 In South Australia the suicide rate decreased by 11 deaths. Yet the story was all together different in 2014-15, when, with the exception of South Australia and Victoria, all states and territories saw their suicide rate rise. 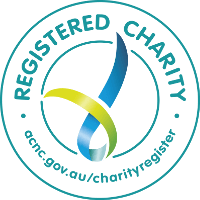 To connect to a community event to mark World Suicide Prevention Day check out their official website. If you’ve lost someone to suicide and are looking for support services please get in touch with our Living Beyond Suicide team on 1300 761 193. For support regarding suicide prevention call Lifeline on 13 11 14.